This reading and the two following illustrate how activists implemented non-violent strategies in different Southern settings—the city of Montgomery, Alabama; the small town of Monroe, North Carolina; and rural Mississippi. They demonstrate the extent to which the civil rights movement was essentially a series of local initiatives. They also invite discussion around several provocative contrasts—male and female, urban and rural, young and old, elite and mass. Suggestions for comparisons and contrasts appear in the discussion questions for the selection from Coming of Age in Mississippi in #7: Voting. How did its urban setting shape the goals, tactics, and conduct of the boycott? How did the women of Montgomery obtain the support of the city's black ministers? What roles did the ministers play in the boycott? What roles did religion play in the boycott? 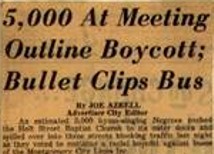 What roles did publicity and the media play in the boycott? How did the response of the white community affect the boycott? What role did women play in the leadership of the boycott? What leadership qualities promoted the boycott's success? What effect did the boycott have on the black citizens of Montgomery? How does Robinson's narrative frame the civil rights struggle within traditional American political values? How does Robinson present herself in this excerpt? - Montgomery bus boycott, Ch. 7-8 in The Autobiography of Martin Luther King, Jr. Image: Montgomery Advertiser, 6 December 1955, detail; permission pending from the Alabama Department of Archives and History, Montgomery, Alabama.